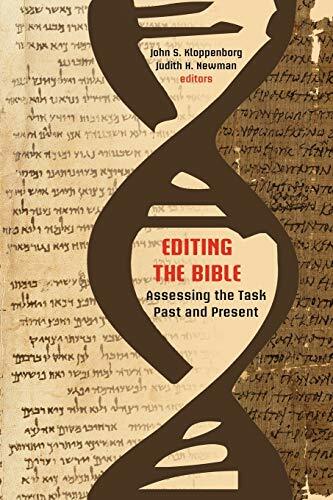 [PDF] Editing the Bible: Assessing the Task Past and Present (Resources for Biblical Study) (Sbl - Resources for Biblical Study) | Free eBooks Download - EBOOKEE! Posted on 2017-10-12, by luongquocchinh. Description: The Bible is likely the most-edited book in history, yet the task of editing the Hebrew, Aramaic, and Greek texts of the Bible is fraught with difficulties. The dearth of Hebrew manuscripts of the Jewish Scriptures and the substantial differences among those witnesses creates difficulties in determining which text ought to be printed as the text of the Jewish Scriptures. For the New Testament, it is not the dearth of manuscripts but the overwhelming number of manuscripts almost six thousand Greek manuscripts and many more in other languages that presents challenges for sorting and analyzing such a large, multi-variant data set. This volume, representing experts in the editing of the Hebrew Bible and the New Testament, discusses both current achievements and future challenges in creating modern editions of the biblical texts in their original languages. The contributors are Kristin De Troyer, Peter M. Head, Michael W. Holmes, John S. Kloppenborg, Sarianna Metso, Judith H. Newman, Holger Strutwolf, Eibert Tigchelaar, David Trobisch, Eugene Ulrich, John Van Seters, Klaus Wachtel, and Ryan Wettlaufer. No comments for "[PDF] Editing the Bible: Assessing the Task Past and Present (Resources for Biblical Study) (Sbl - Resources for Biblical Study)".